Deal Physical damage to target enemy and call a random ally to Assist. Dispel all debuffs on target ally. That ally recovers 50% Health and 50% Protection, and all allies gain Advantage for 2 turns. Deal Special damage to all enemies and call two random allies to Assist. All allies gain 100% Turn Meter and the Master Plan buff for 1 turn, which can't be Prevented or Dispelled. This ability starts on cooldown. 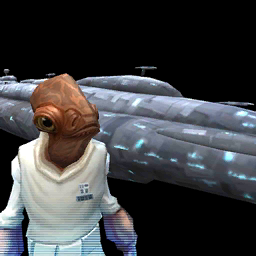 Master Plan: After this ship uses an ability during its turn, their cooldowns are reset and they gain 100% Turn Meter. Whenever an ally attacks out of turn, they have +50% Critical Damage and gain Protection Up (30%) for 2 turns. These bonuses are doubled for Rebel allies. Reinforcement Bonus: Reinforcements gain Advantage for 1 turn.